After several months away doing other things, the S.E.K.Z. crew returned to their usual "noggin and natter" meeting at the Halfway House. Previous meets had included the outing to North Weald Drags and representation at the excellent Matching Green Car Show in July. We love the Matching Green Show with its cosmopolitan mix of old and new classics and great family fun-day atmosphere. 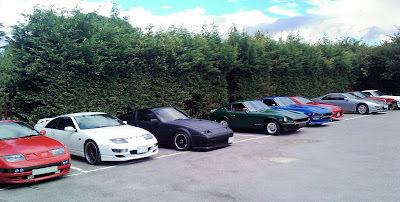 Charles Leekam took delivery of his new Z32 SWB (far left), Tony A's SWB TT in matching white (the new black), Geoff Jjordan's Z32 TT and my own 350Z Stillen SC.